Grand Lake Towing on Grand Lake, Okla.
TowBoatUS Grand Lake provides immediate response services for boaters, offering reliable service by skilled professionals 24 hours a day, 7 days a week. GRAND LAKE, Okla., April 17, 2012 Capt. Wade Silzer and Capt. Tom Benton, two lifelong boaters, friends and well-known marine professionals on Oklahomas Grand Lake, have started a new service that will be a boon to boaters who need a jumpstart, run out of fuel, have a mechanical breakdown or run aground. Their new company, Grand Lake Towing, has joined the BoatU.S. on-the-water-assistance network. Similar to an auto club for boaters, BoatU.S. offers on-the-water towing plans for freshwater boaters and anglers for just $85 a year that will tow you anywhere on the lake. The price includes BoatU.S. or BoatU.S. Angler membership. Unlike the sometimes well-intentioned yet hit-or-miss help provided by friends or family, reliable service from skilled professionals is available 24-hours a day. Without an annual towing plan, the average out-of-pocket cost is about $600 per incident. Silzer, who owns Rebel Marine and Captains Corner boat repair and storage facilities, and Benton, a marine surveyor with more than 30 years in the marine business, saw the need after a terrible winter storm wreaked havoc on the lake in February 2011. It was a catastrophe, Benton said. We had 14 marinas collapse from heavy snow loads. With so many boats damaged and in need of transport for repair, Benton and Silzer immediately recognized a problem: a shortage of towing resources. And then a light bulb went off Someone ought to start a towing service on this lake. A short while later, they decided that the someone should be them. Benton and Silzer spent months doing research and, last fall, decided to affiliate with BoatU.S., the worlds largest boat-towing program with more than 600 towboats servicing hundreds of ports and waterways. Since then the companys two boats Silzers 24-foot Pro-Line with a 225-horsepower Yamaha engine and Bentons 25-foot Hydra-Sport powered by twin 150 horsepower Yamahas have been painted a distinctive red and fully equipped with towing gear, powerful pumps, battery jump packs, plugs, tools for minor repairs and extra fuel. Grand Lake is a major recreational boating area in northeast Oklahoma with an estimated 6,000 boats, ranging in size from runabouts and small fishing boats to 50-foot plus cruisers, houseboats and sailboats. With its many creeks and tributaries, the lake covers 46,500 acres and 1,300 miles of shoreline, with the major boating area about 33 miles in length. Benton and Silzers company will serve the entire lake. Silzer keeps his boat at his home in Duck Creek; Bentons boat is across the lake in Thunder Bay Marina. With two of us in the business, we can get to most areas on the lake within 30 to 45 minutes, Silzer said. 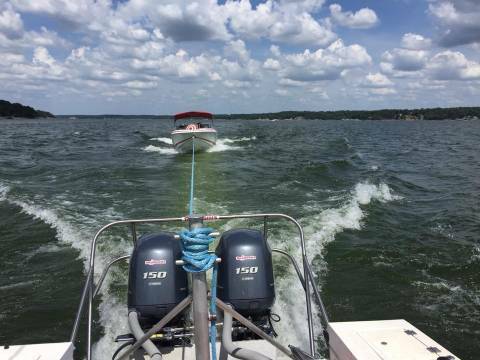 Boaters can contact Grand Lake Towing 24/7 by calling (918) 782-8600 or (918) 782-8604, or calling the BoatU.S. toll-free Dispatch Service at (800) 888-4869. To see the location on a map, go to www.BoatUS.com/grandlaketowing. On-the-water towing is just one service offered by BoatU.S. Boat Owners Association of The United States, the nation's leading advocate for recreational boaters providing its half-million members with government representation, consumer programs and money-saving services. For more information, go to www.BoatUS.com/towing or call (800) 391-4869.